The new Pramac Industrial Gas range has been unveiled in the UK to include several models offering an alternative fuel choice for stand-by generators in the industrial market. 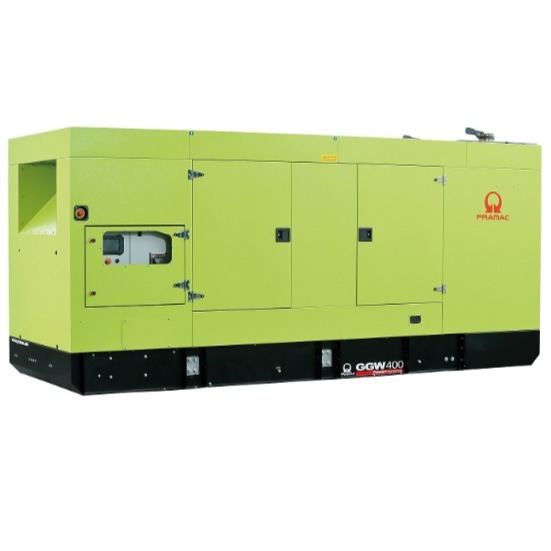 The new gas generator sets, available from 200kVA through to 500kVA, are as high performing as their diesel counterparts and due to the engine technology, provide longer runtimes and a greener fuel solution, with reduced NOX emissions as low as 20mg/Nm3. With the burgeoning green agenda and increasing demand for alternative fuels in back-up power, natural gas is an inspired solution for many stand-by genset applications with uses across healthcare, commercial and residential builds, data centers and manufacturing. The Pramac Industrial Gas range uses proven technology from Generac® Industrial spark-ignited engines with rich-burn combustion. The unrivalled engine technology provides 10 second start times and high load acceptance capabilities which are required in mission critical applications, outperforming many of its diesel and gas fuelled competitors. Optimised for performance and responsiveness to load variations, and combined with modular design from Pramac, the new gas sets offer integrated control technology for ultimate flexibility, scalability and robustness for crucial loads. With several environmental benefits offered including less nitrogen oxides and particulate matter emissions than comparable diesel-fuelled engines, the Pramac Industrial Gas range is particularly attractive in urban areas where utility pipeline gas networks already exist. Gas generator sets reduce the need for onsite diesel fuel storage and containment, thereby increasing power density and reducing the risk of fuel spillages, environmental concerns and CAPEX/OPEX costs associated with storing diesel fuel. All the Pramac Gas generators are equipped with a unique open source power controller through Power Zone. Installers and facilities managers are no longer locked into proprietary control systems when managing power data and remote performance functionality. All data can be accessed via tablets, PCs or mobile devices for ultimate connectivity and accessibility when checking the health of the generator set. The new Industrial Gas portfolio will be integrated into the company’s current petrol, diesel and hybrid power ranges which now includes over 150 products including stand-by, rental and portable generators. For further information please visit www.pramac.com/gas or contact Pramac-Generac UK 01270 445 777.